Over the 4th of July, my sweet husband continued a little family tradition by booking a short stay at a local-ish resort, Semiahmoo. Its always been a favorite get-away spot for us as a family, and also a weekend or date night. I probably thanked my husband a million times for this getaway, over the past week. And, I didn't even bring my phone with me! I challenged myself with extreme rest because I don't think I've ever needed it more, and you guys... I can't begin to tell you what that feels like. If you've never actually left your home behind for several days, I encourage you to! At first it feels almost scary... then you begin to relax and something crazy happens- You become truly unplugged and engaged. We love this resort-always have. You can literally sit on the beach, sip a cocktail and watch the tide go out, while keeping an eye on Canada. What we have loved as our kids have gotten older, is the fun freedom to roam there. They had a blast doing their own thing and then we'd meet up for meals and beach time, etc. One morning, Joe left and came back with some big clam shells that were softly sand-washed and beautiful as a little love-offering to his mama. I knew I wanted to do something special with the biggest one. I decided that a treasure like that should be used daily. 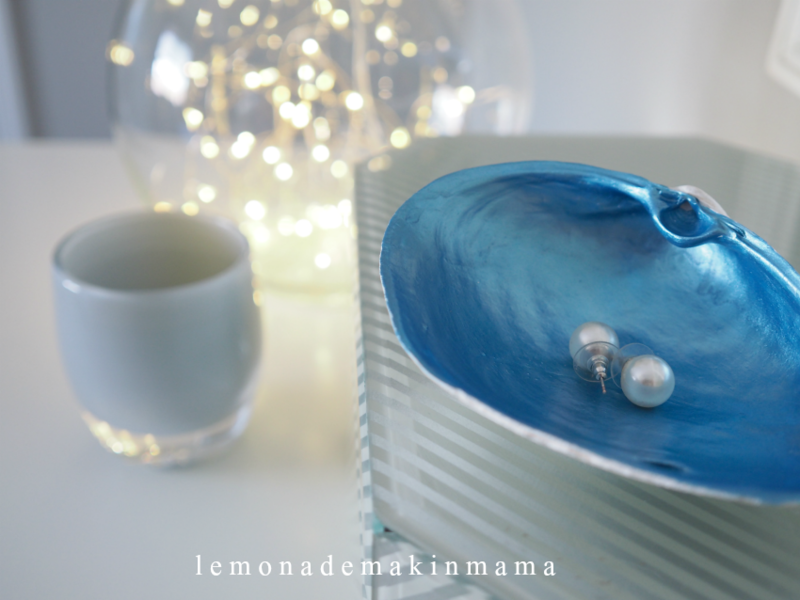 I went to the craft store and found some metallic blue paint, coated the inside and now have the most special ring dish for my dresser! I loved this color. It was called "ice blue." First, I washed the shell with a mixture of bleach and dish soap, letting it soak for about an hour before gently brushing clean. I rinsed it well and let it air dry overnight. Then, I coated it with paint, going all the way to the edges. I gave it a second coat to smooth it even more, and let that dry. It looks so perfect here on my dresser! Looking at it, makes me smile and remember my son's precious and happy face as he brought it in to the hotel room for me. They always say that the best things in life are free. My love language is gifts, and for me, it's about his expression as he waited to show me his little pile of shells, collected with me in mind, his excitement over his finds, and I love it, because I love him. I'll treasure it always. I realized that it would actually be a beautiful and thoughtful (and inexpensive) little gift idea! If you can't gather your own shells, you can always find them this time of year, at craft stores. Wouldn't this be a sweet gift to create and combine with some pretty earrings or something, for a friend or family member? P.S. Soon, I'll be sharing about the new camera I'm using. If you follow me on Instagram, you've already seen it... but I'm so in love. That post and a clothing one are coming next week if all goes well! That is so pretty Sasha. And the story behind it made my heart melt...what a sweet young man you have. It turned out lovely, Sasha and as you know, the true beauty is the story behind it. It looks really pretty! I would not say it was crafted at home by just looking at it. Great job! As soon as I am done doing my research about Apexessays.com prices, I am going to make myself one as well! Thanks a lot for sharing!